That night one year ago, after dinner, I was in the dining room talking to my wife Heather when our thirteen-year-old daughter Maggie came in to ask me for help with the stereo. I followed her to the parlor, which for the last few years is where I keep my home office, and which, for simply practical purposes, is where our full stereo system is. What Maggie specifically needed assistance with was the turntable, the cover of which was tilted open. I bent down and pressed a few buttons on the receiver and made sure it was set to “phono,” then stood back up to lift the tonearm over an LP she’d already placed down on the platter. I hadn’t brought my reading glasses with me to the parlor, so I couldn’t tell what record she’d been trying to play; and I carefully laid the tonearm down on the black vinyl, anxious to find out. I heard a split second of guitar, then the voice of Lou Reed going, “Well, I’m beginning to see the light,” which meant that what Maggie had been trying to play was the second side of the Velvet Underground’s third album. “OK, thanks, Dad,” Maggie said quickly. She was obviously trying to get me to move along so she could be alone with the music of the Velvet Underground and before I could express any overly-gushing approval of her listening choices. She’d heard all that before and she knew—yeah, how cool I thought it was that she was listening to music like the Velvet Underground instead of the usual crap that’s marketed to teenagers (and I also saw that she’d pulled Big Star’s Radio City off the shelf to play next). So I went back to the dining room, where Heather and I had mostly likely been discussing the coming horrors of the United States of Trump. The following afternoon, while waiting in the car with my six-year old son Julien for Maggie’s school bus to get back to town, I had the stereo on. Julien had been looking at a book he’d brought home from his school’s library when he stopped to listen to the music that was playing. Ever since hearing a few weeks earlier that Leonard Cohen died, Julien had been obsessed with the people who are no longer with us. “Play something by someone who died,” Julien said. I clicked the tab to play the next song on the random mix. He’d heard Lizzy Mercier Descloux’s music before, but it had been a while. Also, I imagined that the last time Julien had heard “Mais où Sont Passées Les Gazelles?”, it didn’t matter to him whether or not Lizzy Mercier Descloux was still with us. Knowing she was gone, Julien must have sensed something in addition to the beauty of the song. I know, even now, a year later he’s probably still too young to really understand; but on that afternoon I gathered that what he was sensing for perhaps the first time was history. And that the main thing separating the present from the historical past was death. I don’t recall the exact moment when I found out about death, but I’m pretty sure that when I found out I was around Julien’s age—and that when I found out I was obsessed with it. What’s more, with my OCD, it’s an obsession that never diminishes. As it is, not a day goes by when I don’t think about it. What’s more, with my sixtieth birthday coming in a few weeks—and, with a few of my friends having died in the last couple of years—the days seem to be going by rather quickly. But maybe that’s because of all the energy I spend trying not to think about it—making up poems and stories in my head to distract me, to stand as works of defiance and rebellion. And then I think about it anyway. Nevertheless, it’s an obsession I manage to live with. That I’m also able to think what are sometimes incredibly beautiful thoughts is a gift that, I think, is made possible by all the darker places my mind travels. It was five years ago on this day that my father died. Julien still asks about it every now and then, and about my mother as well, who he never got to meet. “Did your Mom and Dad die?” he’ll ask. If Julien is anything like me, which I gather he is, the question of who else died should soon evolve into something like, Who else was once alive and shone upon us with their bright light? Or something along those lines—both he and Maggie, I’m sure, will develop their own ways of expressing their defiance against everything that is banal and malevolent. They may use words, or they may use sound or sight more, or perhaps a combination of things. But whatever the case, I see them making works of beauty. With every passing year, I think less of my father as being gone and more for what he was when he was alive, a man of many years and miles, an immigrant of color to this country, a worker who worked in small but steady ways to build a world. This day is for him, and all of those like him who take more pleasure in creating rather than in destroying, who create a path through restlessness and confusion, making space where there once was none, who shine upon their surroundings with a great but subtle gleaming. And woe unto anyone who attempts to diminish that shine. 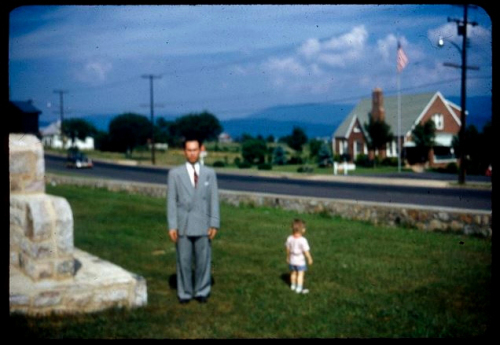 This photograph of Cosme Padua was taken somewhere in the Shenandoah Valley around 1950. This entry was posted on February 27, 2018 by Vox Populi in Humor and Satire, Music, Personal Essays, Poetry and tagged Cosme Padua, Heather Davis, How Does It Feel to Be Loved and All the Other Questions I’ve Ever Wanted to Ask the Armed Cheerleaders of the Corporate State as an Act of Defiance, Jose padua, Lou Reed, Maggie Padua, Velvet Underground.